Lerida (Spain) (AFP) - Belgium's Jelle Wallays held his nerve Thursday to win a sprint finish to the 18th stage of the Tour of Spain, with Britain's Simon Yates retaining his overall lead. 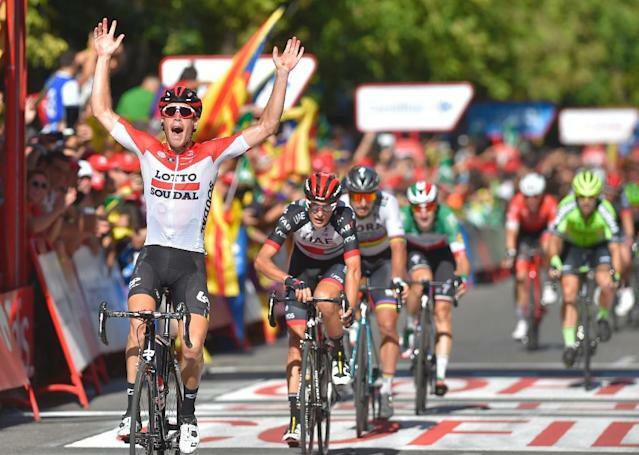 Wallays, riding for Lotto Soudal, held off Norwegian Sven Erik Bystrom, with Slovakia's world champion Peter Sagan coming third in a strong finish by the chasing peloton. Mitchelton-Scott rider Yates remained 25 seconds ahead of his nearest rival, Spanish veteran Alejandro Valverde, in the general classification. Another Spaniard, Enric Mas of Quick-Step, stayed in third, 1min 22sec behind the red jersey. "It was ok today until the final, it was very fast because of the wind and that made it hard, but for the rest it was a nice day and probably the easiest of the race so far. I am looking forward to tomorrow now," said Yates. "I was just trying to (be) safe with my positioning in the final, there was quite a lot of roundabouts coming into town and up near the front is the safest place to be. I wasn't thinking of bonus seconds." Friday's 19th stage is a mountainous 154.4km ride from Lerida to the Naturlandia nature park in Andorra, something not lost on Yates. "It's going to be very difficult over the next couple of days, but we will try," the Briton said. "I know the roads, so maybe that will help a little bit, but it is going to be very difficult and I will give it my best shot." Wallays was left happy his risk-taking paid off, praising ex-French rider Thomas Voeckler for his words of wisdom after the duo had shared a sprint finish, won by the Frenchman, back on the Paris-Tours in 2014. "Today I applied a lot of the advice he gave me: stay cool, ride quietly because everybody wants a sprint," the 29-year-old Belgian said. "I put all my cards on the table, I had no fear of losing. I was already happy to have put on a show for the public in the last kilometre."